Women in Intelligence and National Security (WINS) is a diverse student-led organization that seeks to enhance the merit of its female and male members in the intelligence field and affiliated professions, by empowering them with the necessary tools to realize their future personal and professional ambitions. To facilitate connections between future intelligence professionals and current members of the US Intelligence, National Security, Military and Law Enforcement Communities who support the principles of this organization. Dr. Craft holds a doctorate in public policy and administration with a concentration in homeland security policy and coordination. She joined the CCU staff in 2018. Before full-time teaching, she served 20 years of active duty in the U.S. Army as an All-Source Intelligence Warrant Officer. She has provided strategic and operational intelligence analysis of nation-state and non-state threats to U.S. interests, policy, data, and networks in/around Asia, Europe, the Horn of Africa, the Middle East, Southwest Asia. She has also worked overseas in Kosovo, Germany, Kuwait, and Iraq. Dr. Craft has presented research in conferences and webinars on the threats of agro-terrorism and the potential for anomie; setting the conditions for community development and competence during crises; and emerging threats during post-normal times. She is also the co-author of a book focused on innovative research regarding methods and applications for creating comprehensive environmental education programs that support sustainability practices. 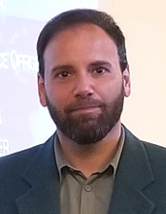 Dr. Fitsanakis has taught and written extensively on intelligence policy and practice, intelligence collection, information security, communications interception, cyber- espionage, and transnational criminal networks. Prior to joining CCU in 2015, he built the Security and Intelligence Studies program at King University, where he also directed the King Institute for Security and Intelligence Studies. Since coming to Coastal, he has received the University-wide Distinguished Professor of the Year Award, the Edward College John B. Durrell Award, and the Department of Politics Professor of the Year Award. Dr. Fitsanakis is also deputy director of the European Intelligence Academy and senior editor at intelNews.org, an ACI-indexed scholarly blog that is cataloged through the United States Library of Congress..